Can an average investor use foreign currencies as a hedge against the rapid decline of the purchasing power of the US dollar? Last week, friend Chuck Butler and I discussed WHY investors should use currencies as an inflation hedge. This week we discuss HOW even small investors can do so from the comfort of their own home. DENNIS: One final tidbit about foreign accounts before we move on. Some pundits believe that having money in several countries is the ultimate diversification – out of reach of the US government. Despite the fact that foreign money managers with US clients must go through an extensive process to comply with SEC regulations, many readers, particularly small investors, are understandably not comfortable with the idea. When investing in foreign stocks you can make/lose money in different ways. For example, Parkland Fuel is traded on the Canadian exchange. 25% Canadian tax is taken out of their monthly dividends. I’ve given up trying to figure out how to get the taxes back. Readers should look at their NET return before buying an investment. Additionally, the stock may rise or fall, and so does the Canadian dollar. Look at each element independently. Your profit/loss on the stock comes when you sell it; whereas your profit/loss on the currency comes when you move to a different currency. Do your homework. 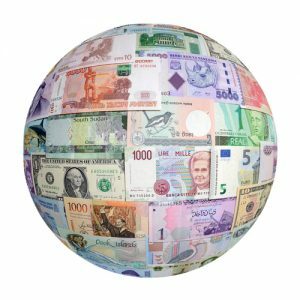 Deciding what foreign companies to buy, what currencies to use, and the timing of buying and selling is what international traders deal with daily. If you pick the right stock – and the right currency – you can do very well. Don’t be shy about asking for help. Let’s look at other alternatives. There are several Exchange Traded Funds (ETF) that allow you to invest in foreign currency. Chuck, can you explain how these ETF’s work? CHUCK: Currency ETF’s are just like their brothers on the U.S. stock side. The ETF represents the currency it says it does. For example, FXA is for the Aussie dollar ETF, and FXE is for the euro ETF, etc. I’ve never been a real fan of currency ETF’s because you would have to jump through fire hoops to get the currency out of the ETF delivered to your foreign bank account. When you sell, the currency is converted back to dollars and put in your brokerage account. As we discussed, diversification is an added layer of safety. If an investor wants to go the ETF route, again I’d recommend they diversify among several. DENNIS: You mention the funds are only redeemable in dollars. When would an investor want to have their account credited in foreign currency as opposed to US dollars? CHUCK: Anytime you sell a currency ETF you are converting back to dollars. You’re not only creating a taxable event, you’re also incurring conversion fees. Here’s a couple of examples where you may not want to do that. I used to run a foreign currency trading desk. We had people all over the world use our currency deposit accounts to hold euros, while their BMW or Mercedes was being built. They would go to Europe, pick up the vehicle, pay for it in local currency and drive it through Europe. You can’t do that with an ETF, you would end up paying fees to convert out of, and then back in to Euros. Using your Parkland Fuel example. If an investor had a Canadian dollar ETF and wanted to buy a Canadian stock for better yield, they would have to sell the ETF – pay taxes on any currency gains – then pay fees to convert to US dollars and then back to Canadian dollars. If they held Canadian dollars in a Canadian denominated savings or brokerage account, they would just buy the stock on the Canadian exchange, avoiding the taxable event and double conversion fees. DENNIS: EverBank, your former employer, offers Certificates of Deposit (CD) denominated in foreign currency. Can you explain how they worked, and how they differ from the other options we discussed? CHUCK: Ahh yes… my former employer… In June the EverBank name will be no more. Last year they were purchased by TIAA and soon the name will be changed to TIAA Savings Bank. There are many differences, so here we go! EverBank World Markets offers CD’s denominated in the foreign currency of an investor’s choice (about 25 currencies). When the CD is opened your dollars will be converted to the foreign currency and put on the bank’s books denominated in the foreign currency you selected. The account is FDIC insured. FDIC insures the deposit in case of failure by the bank, it does NOT cover currency fluctuations. There’s a conversion fee (less than 1%) when you open the CD, and another when you decide to close it. The CD’s are automatically rolled over with no conversion fee at maturity until you tell the bank to close out the CD. Since there is no conversion on rollover, the holder maintains their original cost basis in the currency. If the currency gains in value VS the dollar, the holder of the CD can close out the CD and convert the principal and interest back to dollars, with a gain that would be used to offset the loss of purchasing power of a weaker dollar. They also offer several baskets of currencies, allowing an investor, to diversify for added protection. Unlike a US dollar CD, where you are encouraged to tie up your money for years, many investors ladder EverBank CDs with three-month maturities so one matures each month, which makes their funds fairly liquid. You can also have a savings account, which most people use to hold currencies for short periods of time, waiting for the right time to convert, or for whatever they have bought from a foreign business, or a house to be ready to purchase, or a deposit on a vacation rental, etc. The savings accounts were created in 1988 by a man named Frank Trotter. It’s strictly voluntary – no pressure – no hassle! Click the DONATE button below if you’d like to help. DENNIS: Investing and holding foreign currencies is not as complicated as it sounds. Let me try to break things down into simple steps and you can tell me if I am accurate. Step 1 – Decide if you want more inflation protection by diversifying into foreign currencies. Step 2 – Decide what currencies you want to own. Step 3 – How much do you want to invest? Consider fees of the various options as they could become a factor. Step 4 – What are your risk priorities? Are you comfortable just holding currency, or do you want to invest in stocks or bonds that may provide yield and appreciation? Step 5 – Where do you want to invest? Are you comfortable going offshore, or do you want to stay in the US? I’m confident if you talk to a US broker, an ETF salesperson, EverBank or an offshore money manager they would be very persuasive about why their alternative is best for you. Do your homework; make your own determination. You may find that diversifying among the options works best. Step 7 – don’t get discouraged! Remember the goal. If you feel the dollar is falling in value, you must protect the buying power of your life savings. Investing in foreign currencies is like a bicycle helmet – you don’t need it until you crash! Then you’re doggone glad you have it. Chuck, did I miss anything? CHUCK: Dennis, you did a great job of taking all the mumbo jumbo and putting it in precise words for your readers! Currencies are an excellent way to diversify your investment portfolio. IF the dollar continues its decline that began last year, you’ll be able to offset the loss of purchasing power, which I’ve always considered to be a “tax”. I hate to see baby boomers and retirees lose purchasing power of their life savings! I don’t believe that anyone should go “all-in” with currencies or Gold/Silver. Use them as a diversifying tool for your investment portfolio protection. I told my audiences… You buy fire insurance and hope you never need it right? You buy health insurance with hopes that you never need it, and flood insurance, etc. Diversifying one’s investment portfolio is insurance against a falling dollar. DENNIS: Chuck, thank you so much for your time. I get a lot of email from readers who say good things…. CHUCK: It’s always a pleasure Dennis, thanks for inviting me. Dennis again. Regular readers know I’m doggone concerned about inflation destroying the purchasing power of our nest egg. As Chuck said, “It’s a hidden tax”; and I don’t want to pay it. Gold isn’t the only option. For investors, big and small, buying and holding foreign currencies has never been easier. Jo and I have been invested in foreign currencies for almost a decade. The Fed is targeting 2% inflation using the bogus accounting, so it could easily be much worse. While currencies rise and fall with the market, we’re not going back to “all in” with dollars. It’s much too risky! 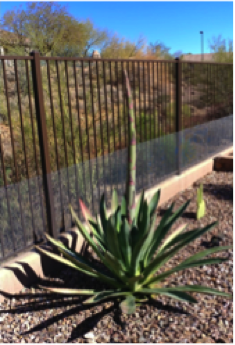 In late January our century plant began growing a stalk out of the middle. In a week it shot up a couple of feet. Unfortunately, it’s a sign the plant is soon to die. Over the last three months, we’ve watched the center stalk grow rapidly, much higher than we could have imagined. I stand six feet tall and it towers over me! ROMEO (Retired Old Men Eating Out) buddy Scott L. uses the stalks to build some very fancy walking sticks. It takes several months for it to dry once it’s harvested. He uses the center section which is like a very hard wood. After many hours of sanding, staining and polishing they are really beautiful. 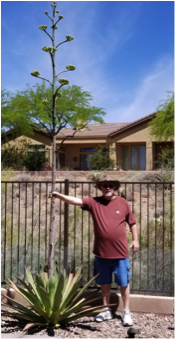 Sad to report, it was harvested this week and the hole will be filled in with a new saguaro cactus. The center stalk is drying out and hopefully, we will have a new walking stick before Christmas. As time goes by, I realize how totally accurate some simple sayings really are. This sign was made by Gable Sign Works and he allowed me to take a photo and share it. I do not understand how other fiat currencies, which are basically derivatives of US$ can protect against inflation. Aren’t they all going down against gold/ real goods, etc? You ask a good question. I’d begin by referring you to the first half of the interview where Chuck talks about selecting an offset currency. Currency trades in pairs, you swap dollars for Euros or something. If one goes up, then the other goes down in value. The key is to select the offset currency properly. The black market in Argentina is an interesting example. They have an “official” exchange rate for converting dollars to Pesos. The Peso is inflating rapidly. Here is a link to the data: https://tradingeconomics.com/argentina/inflation-cpi The locals want dollars before their currency loses more value. I have friends who live there who tell me, on the black market, they can get many more pesos per dollar than the “official” rate. Even though many central banks are flooding the system with their respective currencies to maintain some sort of parity, individual currencies fluctuate in value in relationship to one another.